Reupholster and Repair Your Chairs! Call us on 0800 046 3988 for a quotation. With a whole range of fabrics to choose from, whether you are trying to coordinate with existing colours or looking for a change from your current fabric, reupholstering is a great way to re-use your chairs. The reupholstering and repair service can be used for all types of seating from sofas, soft seating, office chairs, meeting and conference chairs to lecture theatre seating. Choose from a range of chair repair and reupholstery services from the full seating refurbishment service to just reupholstery or repair. The texture and colour of the fabric play a part in choosing the fabric. From executive style leather or faux leather (vinyl) to design-led patterns and colours, whatever space you are trying to create for, there are many different styles of fabric to choose from. Fabric manufacturers are introducing new ranges, which include more eco-friendly fabrics, through to more specialist fabrics for different commercial environments. From sofas to tub chairs whether you need a corporate look or a designer fabric style, there are many fabrics to choose from. There are patterned fabrics, different textured fabrics and vinyl that can be used for sofas and soft seating. Reception areas are an important part of the office and whatever industry you are in, first impressions count. From office desk chairs that are fully upholstered to those with a mesh back, reupholstering office chairs is ideal if you are looking for a new fabric colour or type. If your desk chairs are the perfect style for your office and you are looking for a different fabric or there is a major office refurbishment - it's an ideal time to reupholster your chairs to coordinate with new office decor. Designer branded chairs such as Wilkhahn, Orangebox, Hille Supporto, Herman Miller, RH Logic and Steelcase, can be fully repaired and reupholstered. Leather executive style chairs, can also be reupholstered, there are different ranges of leathers or faux leathers to choose from in different colours. 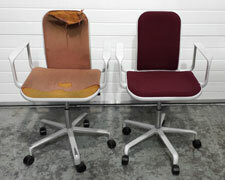 Reupholstering meeting chairs for an office or venues is a perfect way to refurbish the chair. For venue-style conference chairs in addition to re-covering the chairs in new fabric, the frames can be re-sprayed too, which is great for chairs that are often moved around or are stacked. Whatever type of meeting chairs or conference chairs they are - either fully upholstered or mesh back chairs, these can be reupholstered in fabrics, leather or faux leather. Designer meeting chairs with mesh back and seat design such as Vitra Eames chairs can be refurbished with replacement mesh. From breakout areas to reception sofas and cafe style chairs, reupholstering is the ideal way to re-use the chairs that fit perfectly into the space available. In high usage areas, especially if the fabric has been ripped or is worn out, in reception, cafe, or breakout areas, by re-covering the sofas or chairs in new fabric you can give the fabric a renewed look. There are options to recover in vinyl, leather or fabrics to suit all office and commercial environments. Reupholstering lecture theatre seating or auditorium seating is a great way to not only re-use, but can also to make it a cost effective option. Generally, auditorium seating sees high usage and over time fabric can wear out or there may be instances where the weave on the fabric has been caught and the foam can start to appear. By refurbishing smaller quantities of auditorium seating to larger amounts of lecture theatre seating, the chairs can easily be restored. Refurbishing includes: re-padding & re-foaming of chairs, soft seating and auditorium seating, upholstering & recovering of leather and fabric chairs, fixing chair arms, fitting gas lifts, fitting seating tablets (for conference and auditorium seating) and fitting seating mechanisms. We can do these as part of your ongoing maintenance programme or one off works. The Recycled Office - Helping businesses in London & the South-East.